The apartment consists of a kitchen with dining area, hall, bathroom (shower room with utility room), a bedroom with double bed (160x200) and a sofa bed (for extra bed for children), a combined living / bedroom with a sofa bed for 2 persons and a dining table. It also includes a private terrace with seating. They live in a separate lower house. About a house entrance leads through a hallway to a kitchen area, which merges into the actual living area. You also have a bathroom and a bedroom. As we are close to the lake, we have endeavored to include many small maritime details in the rooms. If you do not want to go into neighboring places food, fridge with oven, hob, microwave, coffee maker, refrigerator, dishwasher and all the necessary kitchenware and crockery is provided. You can also hire the TV, VCR or CD player, if you do not want to go from Sitting room from the private terrace with seating / sun group to relax here or in the spring or Autumn want to watch or listen to the pulling cranes and geese. In the living area there is also a fold-out sofa for max. 2 persons (children). In the bedroom (double bed) you überdachen parts of an old fishing net. If you come from swimming day or a bicycle trip "home", you can relax in the shower in the spacious bathroom. Towels and sheets can be provided for a small fee. We have completely renovated our over 100-year-old thatched cottage and refurbished. They live in a separate lower house. About a house entrance leads through a hallway to a kitchen area, which merges into the actual living area. You also have a bathroom and a bedroom. As we are close to the lake, we have endeavored to include many small maritime details in the rooms. If you do not want to go into neighboring places food, the kitchen with oven, stove, microwave, coffee maker, refrigerator, dishwasher etc. fully equipped. You can also hire the TV, VCR or CD player, if you do not want to go from the living room to the private terrace with seating / sun group to relax here or in the spring or Autumn want to watch or listen to the pulling cranes and geese. In the living area there is also a fold-out sofa for max. 2 persons. Another sofa bed located in the bedroom (Kinderaufbettung). In the bedroom (double bed) you überdachen parts of an old fishing net. If you come from swimming day or a bicycle trip "home", you can relax in the shower in the spacious bathroom. A grocery shopping service through us for the apartment is possible to pre order. Towels and sheets can be provided for a small fee. Bikes can be borrowed free of charge. 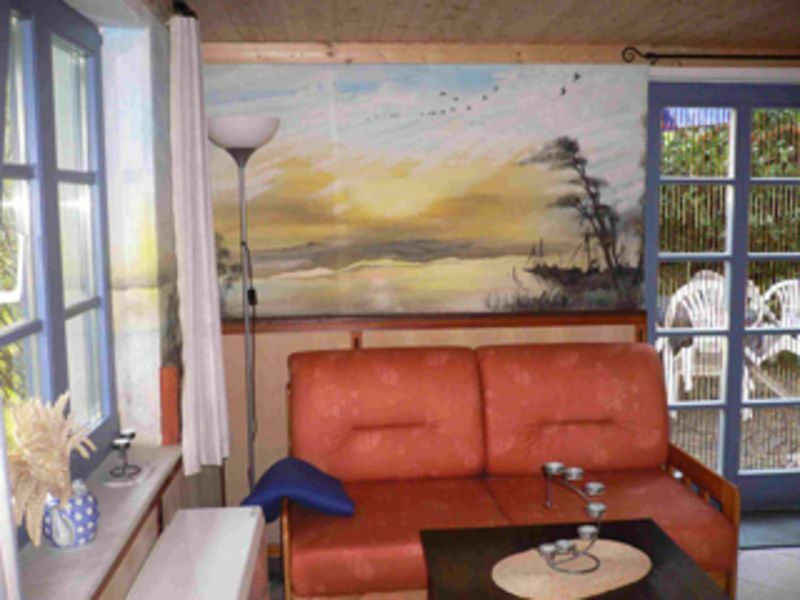 Our apartment is located in Rubitz, a little dreamy 100-soul village in Mecklenburg-Vorpommern, right on the quiet village green with a small stream. 5 km away from the apartment are a small, idyllic harbor (sailing, fishing), right on the Grabower Bodden and a free swimming area with DLRG guard (friendly) .Kilometerweiter white Baltic Sea beach is on Zingst / Darß - just 15 km from the apartment. In bad weather, you can go swimming in indoor swimming pools / water parks in Stralsund or Ribnitz. The "Vineta city" Barth is 5km away and has a town port, restoration and shops. In Stralsund (20km) there is the possibility of boat trips to Rügen, Hiddensee and visiting the Maritime Museum and a walk through the historic old town. In Ribnitz-Damgarten (20km), we recommend a visit to the Amber factory and the Amber Museum. In the region you can go to the extended paths cycling. Bikes can be borrowed for free today. but you can also easily go hiking through golden yellow canola fields and natural meadows. In Barth also has an airport for private jets. By train you can reach us via the station Kenz (UBB train), from the apartment located 2km. Here is a collection by us possible!